Saturday Night Fever star John Travolta has described the death of his teenage son Jett as "the worst thing that's ever happened in my life". "The truth is, I didn't know if I was going to make it," he revealed during an on-stage interview at the Theatre Royal Drury Lane in central London. "Life was no longer interesting to me, so it took a lot to get me better." Jett Travolta died at the age of 16 in January 2009 from a seizure during a family holiday in the Bahamas. Both his father and his mother Kelly Preston have since confirmed their eldest son was autistic and had a history of seizures. The couple have two other children: 13-year-old daughter Ella Bleu and three-year-old son Benjamin. 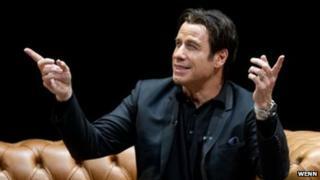 Travolta said he "didn't want to wake up" following Jett's death and that the Church of Scientology had been pivotal to his recovery in the weeks and months afterwards. "I will forever be grateful to Scientology for supporting me for two years solid, I mean Monday through Sunday," he continued. "They didn't take a day off, working through different angles of the techniques to get through grief and loss, and to make me feel that finally I could get through a day." The 59-year-old has been a follower of the controversial religion since the 1970s and said it had "saved his life" on more than one occasion. Travolta's 90-minute appearance saw him field questions about various aspects of his life, career and keen interest in aviation. Also addressed was the mid-career slump that followed his appearances in Saturday Night Fever and Grease, a downturn that was only arrested when Quentin Tarantino cast him as a heroin-abusing hitman in 1994's Pulp Fiction. "It got a little complicated for a few years," the actor explained. "A lot of things added up to a five-year period that wasn't so good for me." Travolta went on to thank Tarantino for facilitating his career comeback. "There were people who were much hotter than me who wanted the role," he explained. "But Quentin put his career on the line and refused to make the movie without me in it." The film ended up securing Travolta his second Oscar nomination, following the best actor citation he received for Saturday Night Fever in 1978. To date, though, the actor has yet to win one of the Academy's coveted statuettes. Yet the star did not seem unduly perturbed. "I don't feel at all ignored or not verified," he told Norman, erstwhile host of the BBC's Film programme. "You're not going to find a bitter guy in me." Sunday's event, held near to, and at the same time as, this year's Bafta Film Awards, came two days before the actor's 60th birthday and ended with him being presented with a cake shaped like an airplane. Members of the audience were invited on stage at one point for an impromptu dance lesson, while a discussion on James Bond led to the star impersonating Scottish icon Sir Sean Connery. "I would love to be a villain in the next James Bond film," Travolta continued, revealing he had openly courted the role during an informal meeting with producer Barbara Broccoli. The actor's appearance followed similar "evenings with" Al Pacino and Sylvester Stallone in London, tickets for which have been offered for as much as £350.